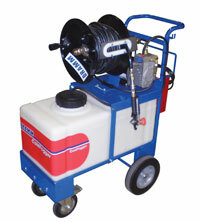 Manitowoc, WI- Dramm has completely redesigned its Coldfogger Low Volume Sprayer. Designed to increase speed and efficacy, the Dramm Coldfogger is a 3,000 psi sprayer that creates targeted, fine droplets that offers excellent coverage with less water and chemical needed. The NEW CF20-150 Coldfogger offers several enhancements over previous models: The tank size has increased from 12 to 20 gallons. The agitation pump is more vigorous and aides in priming the spray pump. The unit uses Dramm's convex reel for less birdnesting of hose. Finally, there is a choice in wheel options for various terrain. Using low volume application, a 20 gallon tank will treat almost 80,000 square feet in 80 minutes. The Coldfogger is great for general spray applications and for spot treatments for all greenhouse and nursery chemicals. For more information on the Coldfogger or any other Dramm products, please contact Kurt Becker at Dramm.